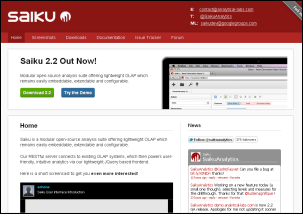 Saiku : A community alternative olap viewer initiated by Tom Barber. Mantle : Alternative BI-Server Preconfigured installation (PCI) that is now incorporated into Pentaho BI-Server 2.0. Pentaho Flash Charts : Pentaho Component for Displaying Flash based Charts/Visualizations. JDBC Kettle : JDBC Driver interface to Kettle Transformations / Jobs. Halogen : olap4j based cube slicer/dicer visualizer written in gwt. Pentaho CDF : Community Dashboard Framework for the Pentaho BI Platform. Pentaho Action Editor : Pentaho Action Editor in GWT. Pentaho Action Sequence DOM 4 GWT : This project modifies Pentaho's Action Sequence DOM so that it may compile within GWT.